Pictured: The Limited Sale is on this weekend! The Limited Friends & Family Sale has begun: Look for special savings this weekend at your local Limited store. 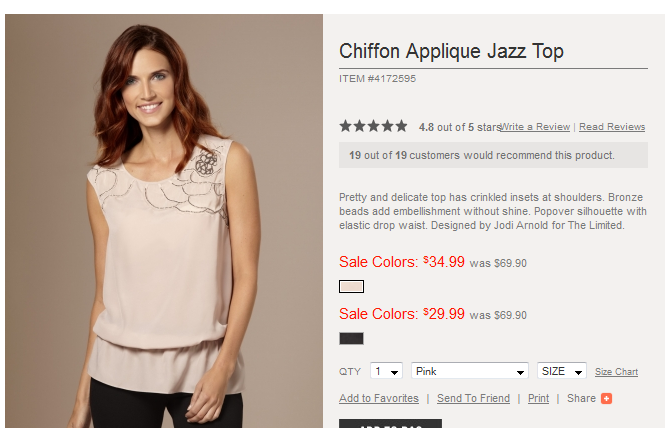 I already placed an order for items from the Jodi Arnold collection that I love. I just ordered the Cabernet Tunic and the Lace Print Dolmain. Of course, the sale prices are so attractive, I may be going back soon to order the Chiffon Applique Jazz Top and the Boyfriend Jacket. Use code 202 to save if you order online. If you're in the Los Angeles area, the Glendale Galleria store will have a special event with a DJ, photo ops, gift card raffles and more. Everyone will be there! 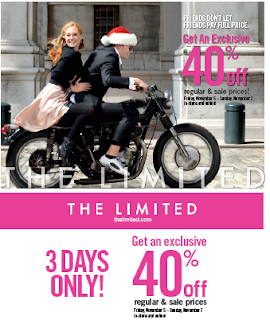 On Tuesday, 11/9 The Limited at Glendale Galleria is hosting an exclusive fashion event with special guests like celebrity stylist Jeannie Mai. Click here for details. There will be an exclusive fashion and shopping event hosted by: Celebrity stylist and host of The Style Network's "How Do I Look", Jeannie Mai; best-selling author and career style expert, Nicole Williams; and Senior VP of Design for The Limited, Elliot Staples.